While an all-white or neutral color scheme oozes of modernity and sophistication—it can simply look boring. We see monochromatic color schemes and rooms all the time in photographs and magazine spreads. It might look picture perfect, but maybe that’s just not the look and feel you want. If you want to add some vibrancy and personality, a simple way of doing that is by adding bursts of color within your space. The kitchen is one of the spaces in your home where you spend most of your time. Why not make it an inviting and exciting place to be in, not only for yourself, but for your friends and family. Transform it into an inviting area for people to spend a little extra time in. With the kitchen style ideas below, your kitchen will pop with more life and color, and maybe even spark some envy from your friends. Who says you should stick to neutral glass tiles for your backsplash? There are so many tiles with stunning colors and designs that can make your kitchen stand out from the rest of the cookie-cutter kitchens out there. Red, green, yellow and blue are the most commonly used colors in these tiles. These are bound to add a warm and homey vibe to the kitchen. Here’s another thing about Talavera tiles—since each tile is handcrafted individually, the size, colors and designs may vary from each tile. That just adds even more charm to these tiles, doesn’t it? While you want to add more life to your kitchen, you don’t want to choose tiles that you’ll eventually get tired of looking at once the novelty wears out. The backsplash is often the focal point of the kitchen, so choose a tile that you really like and wouldn’t think of changing when the next trendy color or design is in. Moroccan tiles are another option to really invigorate your kitchen. Just like Talavera tiles, Moroccan tiles are handcrafted by artisans through traditional methods. If you just want to add a hint of these ornate tiles in your kitchen, then think about mixing Moroccan tiles with solid color tiles on your backsplash or columns. If you’re completely smitten with the idea and aesthetic of Moroccan tiles, then go all out and have them as your floor tiles, as many trendy restaurants have done. Forget about beige and creamy cupboards, because colorful cupboards are in. Designers and home owners aren’t shying away from painting cupboards different shades of, well, just about every color. That’s because this simple renovation makes a strong statement. Colorful cupboards easily transform the look and feel of the whole space—bold colors like red and orange modernize and energize your kitchen. If it’s too difficult to pick just one color for your cupboards, why not incorporate two shades of the same color for your cabinetry? The variation adds more depth and visual interest and you won’t have to be torn about what color to settle on. There’s no way it would have happened in the past, but it’s not surprising to see pink and lime green countertops in kitchens today (they look good, too). An unexpected color on countertops or the kitchen island would make an unassuming kitchen much livelier. 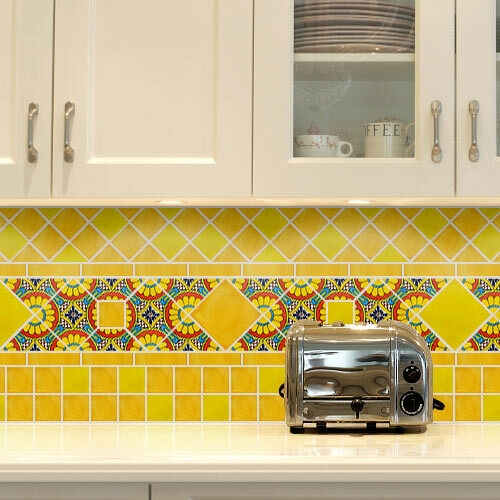 If you’re not quite ready to install new tiles or paint your cabinetry, you can still add flare in your kitchen with vibrant kitchen appliances. Ditch the white fridge and go for the turquoise one. Think about other appliances like your microwave, toaster and stove that can easily be found in varieties of colors. Even in a head-to-toe white kitchen, brightly colored appliances are bound to stick out (in a good way, of course). You could also think about stacking high contrast Spanish style plates on the counters instead of tucking them away. Giving your kitchen a makeover doesn’t have to be daunting or done just by professionals. Sometimes it’s just minor tweaks you could do yourself to make a big impact on how it looks. Just by swapping out neutral shades with more lively colors, you can bring the whole room to life. Something as simple as changing your backsplash to glass tiles could bring in and reflect more light to brighten up your kitchen. Experiment with these different ideas of bringing more color into the kitchen at your own pace to see what will really transform the whole space.